Ella – Wellawaya road (A23) is one of the most scenic roads in Sri Lanka. 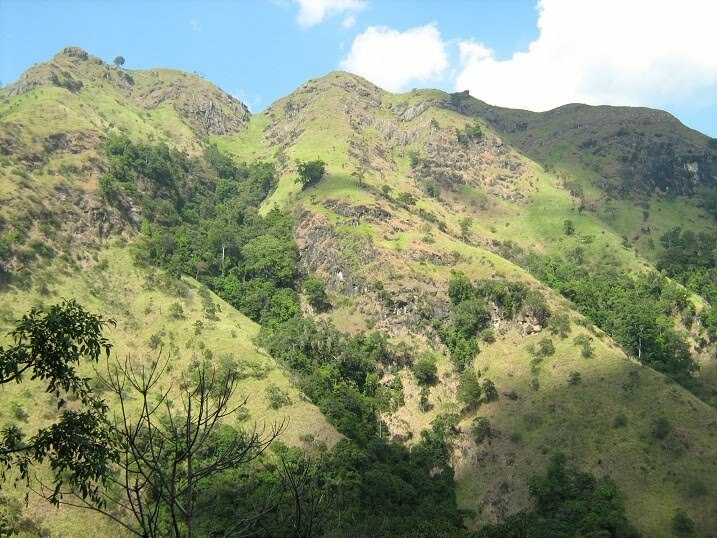 Ella is situated in the eastern boundary of central highlands and Wellawaya belongs to the low country. 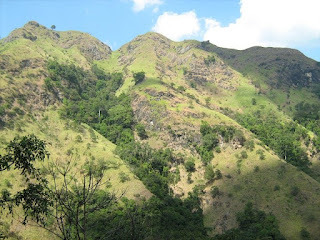 The 30 kilometre route from Ella to Wellawaya will descend you nearly 3000 feet. This elevation difference will give you contrasting landscape from the start to end within short distance. The winding road will take you through one of the most beautiful and unique landscapes in Sri Lanka. The first part of this route is the best part and you will get to see similar sceneries like in the above picture. More pictures of this route are uploaded here. To see more scenic images, explore this wonderful site - Scenic Sunday. It does really look like a very beautiful place. By the photo and your description, it must be a hiker's paradise. Your title is very interesting. How many thirty kilometers we have in our lifetime? I love how green the mountains are. Looks amazing! I will run out of superlatives if you keep posting such wonderful photos K! Valuable information, KP. I am learning a lot about Magerata :). Looks like a very nice hike. If the drop is 3000 ft the climate should also change. Another question is why aren't there any dividers on the road? Beuatiful pictures of a beautiful place. Yep, i didn mention that in the post but this area too is a hiker's paradise. These mountains have a very unique shade of green. Thanks mate! You are doing the same with some fascinating posts of islands in Indian ocean. Yes climat also changes rapidly. temperature also rises during the descend. It is an old road but newly widened and re-done. So when i took the picture (a few months back) it didn't have the dividers. Hi K, I looked at all of the pictures and enjoyed see the road from Ella to Wellawaya... I can tell that you were going down-down-down... Gorgeous views and pictures. To add a few points to your excellent intro to 'Ella-Wellawaya' road; I believe this is an iconic route for anyone visiting Sri Lanka. You will experience the climate zone change so rapidly at one point of this route, from may be 18 Celsius to 35 Celsius within a matter of few minutes. What is that famous waterfall we see along this route? Do you drive, or can you trek? Beautiful!Isn't that the way you get to see Rawana falls? Yep, it is a great area for hiking! Yes, I did not need to adjust anything in my camera. Light was perfect. I actually drove this stretch but you can do lot of hiking here. I will bring some interesting places which you will see only as a hiker in my next posts. Yep that is the road! I'm again and again amazed by the beautiful nature you have there! These photographs are beautiful and the scenery is amazing. It's easy to see why you consider this to be the most scenic road in Sri Lanka. I think the Beragala-Koslanda-Wellawaya road is much more scenic. The road is not good, narrow and pot holes. Stop over for lunch at the only decent restaurant with a fantastic view of Diyaluma falls. 20 mins from Wellawaya, 45 mins from Beragala. I kind of agree with you. Yes, Beragala-Wellawaya road also has similar quick change within a short distance and it is a very scenic road. Diyaluma is a great sight but I am not aware of the restaurant you mentioned. Must check it out next time. I can't wait to visit again!!!! It looks like a great big rock covered in a plush carpet of green.. and a very scenic spot for hiking. The steepness here isn't too high for a beginner too. Yes, there should be a rock underneath. That is why you do not see big trees on most part of the mountain. It is not too steep but still challenging to climb as there are no paths. A lovely scenic road indeed. That is a beautiful route to drive. How I would love to do just that! Very scenic. It is usually this green this time of year? That sounds like such a wonderful drive! Beautiful hills! TT looks like some nice place for trekking! You'll surely like a drive on this road. Yes you could see the same color all 365 days here. Yes this is Ella Gap. Ella Motel is one of my favourite rest houses. It is situated at a perfect location. Ella to Ravana falls section is the best part of this route. Yep, this is a great place for hiking.